On Wednesday February 25, 2015, a team from ESAF set off for Port Said, which lies in the north of Egypt on the coast, just where the Suez Canal enters the Mediterranean. Their first stop was the government veterinary clinic to do TNR for cats. Many local people brought their cats to be spayed/neutered, which the vets did, although the primary purpose of the program was to do surgery for street cats. Next they paid a visit to the zabalin community, who are traditionally garbage collectors. It is a poor neighborhood. They found many animals there, and most looked well cared for. 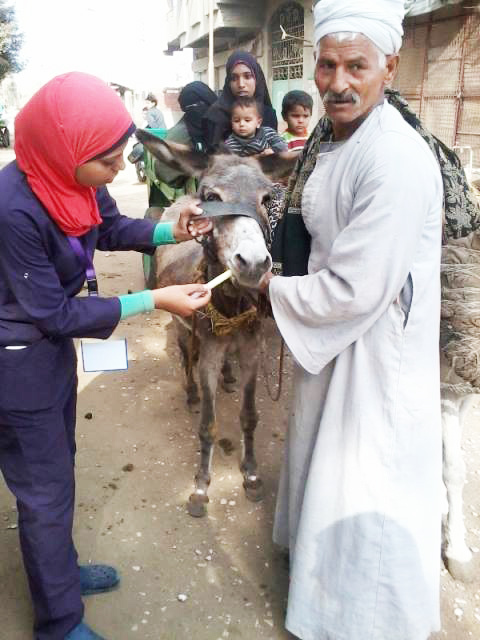 They gave a vaccine card to all patients’ owners, and also handed out fly masks and nose bands, which will make the working animals more comfortable. The vets treated the teeth and hooves of a steady stream of horses, donkeys, goats, sheep and cows, all brought for treatment. Three ESAF board members came along, volunteering their help; Mohamed Mamdouh, Riham Hassan, Jackie Sherbiny. The veterinary team, Dr Ahmed , Dr Eman, Dr Lamis, along with assistants Mohamed Ibrahim and Mohamed Hassan, did a terrific job and were a great help to the animals. The work in the zabalin neighborhood was sponsored by Animal Aid Abroad, and ESAF hopes to be able to continue their work here every two weeks for an extended period. Animal Aid Abroad supports projects to help working animals in several countries in the Middle East, Africa, and Asia. To visit the website of Animal Aid Abroad, click here. Photo: Courtesy of ESAF; This photo is not from Port Said, but was taken during a similar ESAF program at Nazlet El Siman in December 2014.